With the days dwindling before the start of light rail service on Capitol Hill, the King County Metropolitan Council unanimously approved Monday the set of changes to bus service that will commence with the start of U-Link service next year. We have been discussing those changes in this space since April, and along the way public comment has shaped what this proposal contains, in large part by prompting Metro to reduce the amount of dramatic changes that will be made on Capitol Hill. A well-attended meeting in Sand Point earlier this month appears to have been the final nudge for King County Council member Rod Dembowski to introduce an amendment in committee that retains the route 43 in its entirety during peak hours, retaining a direct connection between Montlake and downtown. This amendment passed, and also included a handful of last minute changes to northeast Seattle routes. The deletion of the 43 in favor of increased frequency on the 48 and the rerouting of the route 11 to take Olive Way to get downtown was the most unpopular segment of the restructure proposal. Now the 43 is here to stay, but only at 30-minute frequency at peak times. Monday in comments before the vote, Dembrowski said Metro should achieve “Nordstrom level of service” when it comes to customer feedback and expressed his concerns that “one-seat rides” are going away for many riders outside the city’s core. The optimization plan is “a little bit of a leap of faith,” Dembrowski said promising that Metro will do surveys within a year following the changes to find out how service is working and reminding everybody that we’ll do this again in six years when the U-District light rail station opens. Metro and the council are touting the frequency of the new network, but most of the increased headways are coming not from reducing redundancies with light rail but rather through Seattle’s increased funding for transit service that is adding hours to buses all over the city. What does remain in the proposal is an odd deviation that has been added to the route 8, and the revised route 11. In addition to now being served by the 8, 19th Avenue between E Madison Street and E Thomas St will also become the recipient of downtown service both southbound (on the route 12) and northbound (on the route 11). 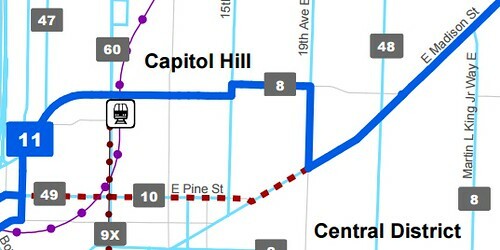 With the news of the 43’s return, unlikely to vary in route because the 43 runs on trolley wire, this means that unless Metro moves the bus stop at Miller Community Center across the street to the west side of 19th, which it is unlikely to do, riders at 19th Avenue E and E Thomas Street will be able to catch a downtown bus during rush hour at any of three corners of the intersection. Those riders would be wise to download One Bus Away to determine which bus to try and catch. King County Metro’s service guidelines for service design call for “Easy to understand, appropriate service”: “A simple transit network is easier for riders to understand and use than a complex network.” It is unknown exactly how the proposed deviation is justified by ridership in that corridor so as to seem to override the agency’s own guidelines. The one thing that is clear, however, is that between this year’s improvements to frequency and next year’s introduction of light rail service, many more transit riders on Capitol Hill should have the ability to get to their destinations at all times of day faster and more reliably. You can read about the last minute changes that were passed by the council here. This entry was posted in News, etc. and tagged bus stop, light rail, public transit by Ryan Packer. Bookmark the permalink. Wow! They listed to feedback? I’m glad the 43 will stick around. I was at this Council meeting and it was most interesting see political process, especially the lack of response by my Councilman. I did offer a last minute fix for the 11 such that the 11 would turn on 15th Ave East and East Pine instead of 19th Ave East. This simple fix was a win win for the council and Metro, but they blew it. This fix would have allowed a smooth transfer from the 11 to 12, allowed the seniors/handicapped in the 4 block area between 15th and 19 to access the ADA complaint buses and lastly it would have allowed the senior/handicapped access to Light Rail. Yes, I am very sorry to see the Council and Metro was not listening to the residents of Seattle. The TrEE committee talked, but compromise, but was unable to do despite the pleas of users of the bus today! I think you mean “six months” rather than “six years”. That would be a long time to wait for the UW Link station. says service begins 2016. It’s service *on the Northlake Extension* through the UW station that’s planned for 2021, afaict. I ride the 43 every day to the U-District. As I live on 19th and John, it makes my commute super easy. But I don’t agree with the proposal to make it every 30 minutes. It should be eliminated completely or be changed to every 15 minutes during peak. People are naturally lazy. This route will be jammed packed at 30 minute intervals. Especially when it is raining and people will not want to ride/walk in the rain. 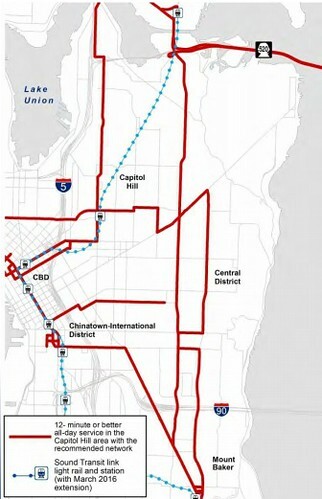 Another alternative would be to eliminate 43 stops near downtown, the Capitol Hill Light Rail Station, and along 23rd. This would allow service in areas “too far” from light rail stations and avoid duplication with the 48 on 23rd. If no change happens, the 43 will be unbearable (too crowded) during peak hours. Won’t it be much more efficient to take the 11/8 (or even 43) in to Broadway and catch the 49? The only problem is the deviation I mention in the article will cause stops to not be the same past 19th. I’d walk to 16th.